iPhone OS 3.0 was released today, and I’ve had a chance to play with it for a bit now. I am very impressed with the improvements Apple has made, and think that 3.0 will be much more welcome in Microsoft Exchange environments. However, it’s still not quite up to the high standard set by the BlackBerry. For the most up-to-date information, see my iPhone Exchange ActiveSync Guide! Apple made some significant updates to all three of the components touched by ActiveSync: Mail, Calendar, and Contacts. The Calendar has been totally re-done, more smoothly supporting multiple calendars, syncing with local calendars and Exchange at the same time, CalDAV and .ICS natively, and allowing on-phone creation of meeting invitations for Exchange users. The Contacts application can now sync with local address books and Exchange at the same time. Mail is more flexible, with per-folder downloading of Exchange messages. The iPhone only supports full ActiveSync with a single Exchange server. Although you are free to establish as many IMAP connections as you like, including connecting to Exchange with IMAP, you cannot use more than one ActiveSync service. Still no notes and tasks sync (with Exchange). Although iPhone OS 3.0 does allow synchronization of notes with Apple Mail for Mac users, it does not support Exchange or Apple’s own MobileMe over-the-air services. ICS and CalDAV seems to be desktop-sync only. Spotlight does not include full-text search of mail messages. Push email remains slow, flaky, and battery-consuming. This is a very tough nut to crack! The mail application gets numerous improvements for all mail servers. Notable among these is landscape mode and spotlight search. When it comes to Exchange ActiveSync, the changes are harder to notice. One thing that struck me was the ability to specify which folders to “push” along with the Inbox. Perhaps this was there all along and I missed it, but I never noticed it before. Note that the Push settings have been moved under “Mail, Contacts, Calendars” in OS 3.0. Although iPhone OS 2.0 supported multiple calendars, it was very confusing and not at all integrated with Exchange. OS 3.0 has cleaned things up significantly. As illustrated, the iPhone now organizes calendars into categories: Those synced from the Mac or PC and those synced over the air from an Exchange server. That’s right – the iPhone can now sync calendar entries over both USB and Exchange at the same time! This is super handy, since iTunes supports CalDAV and ICS subscribed calendars through iCal on OS X, and presumably on Windows as well. I’ve written before about TripIt’s solid iPhone app, and this gives another way to view trips. But the iPhone doesn’t seem to support either CalDAV of ICS over the air, which is something of a disappointment. We can’t have everything, can we? Update: I missed it! iPhone OS 3.0 does include over-the-air CalDAV and ICS! Of course, the new spotlight search supports calendar entries as well, allowing quick access to appointments. Perhaps the most-anticipated calendar feature for iPhone OS 3.0 is meeting invite support. I can confirm that it is possible to create a meeting, add attendees, and send invites right from the iPhone, and that this works over the air! This is a specific Exchange feature, so of course it only works for the Exchange calendar. But you can easily change an existing non-exchange item to the Exchange calendar and start inviting attendees, even those not using Exchange. But there are still limitations. You cannot add invitees to someone else’s meeting. You cannot make any changes to an appointment synced from the desktop (CalDAV and ICS included). You cannot forward a meeting request from the calendar app. You cannot see free/busy time when scheduling. It’s not like you have Outlook in your pocket! One more weird thing I noticed: Nearly every app now has a landscape mode, including mail and contacts, but calendar is locked in portrait only! The other application to see some updates is Contacts. Like the calendar app, Contacts can now sync to both local desktop and over-the-air Exchange sources at the same time. The iPhone sync combines desktop sources into an “on my iPhone” category and maintains Exchange contacts separately. It also includes access to an Exchange global address list (GAL), and this seems to work much better now than it used to. Contact management is somewhat limited, however. If you locate a user in the GAL, you can’t add them to your Exchange or iPhone contact list without copy and paste (did I mention that it works?) or finding an email message from them. The phone also has no de-duplication features, so if your desktop contact list is synced with Exchange already you will have a world of duplicate entries. 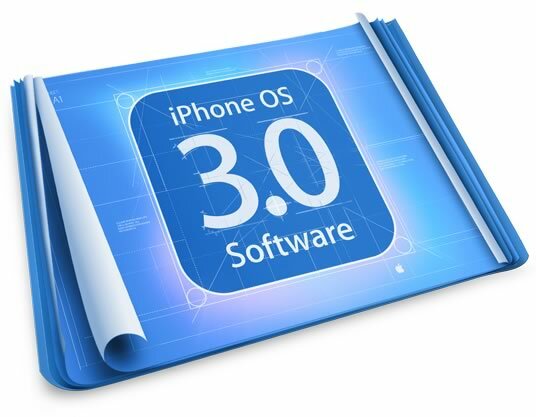 All in all, iPhone OS 3.0 is a worthwhile upgrade, especially for business users. Everything seems to work more smoothly and logically than in 2.0, and the added Exchange calendar invite support is great. The complete set of additions, from copy and paste to spotlight search, are excellent as well. But, like the Mac, the iPhone remains just a bit left-of-center in the world of business and Microsoft Exchange. Maybe that’s for the best! Check out Paul Robichaux’s comments on 3.0’s mail as well!